Sino-Mongolian relations improved during the fall, with a pair of official visits demonstrating progress on both economic and military ties. 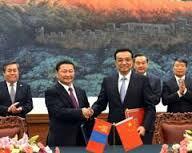 The first was Mongolian Prime Minister Norov Altankhuyag’s trip to China on October 22–26. During the visit Altankhuyag and Chinese Premier Li Keqiang agreed to a number of new large-scale medium and long-term cooperation projects aimed at strengthening the strategic partnership the two countries had established in June 2011. Among them were an agreement by the three Mongolian companies that mine coal in Mongolia’s Tavan Tolgoi basin to export 1 billion tons of coal, worth potentially $50 billion at current prices, to China’s Shenhua Group Corp. in the next 20 years; establishing a coal gasifying plant with Sinopec Group to produce gas for export; and creating a working group to oversee construction of new road, rail and pipeline infrastructure connecting the two countries with Russia. The second trip from November 13-16th was made by PLA Deputy Chief of Staff Lieutenant General Wan Guanzhong, who led a Chinese Defense and Armed Forces delegation to Ulaanbaatar for a 7th Ministerial meeting. With the coal agreements, the Mongolian government appears to be trying to reverse a downward trend caused by Mongolian efforts to reduce its dependence on the Chinese export market by limiting Chinese coal companies acquisitions and projects in the country (see China Brief, August 23). Efforts to improve the relationship also reflect a Chinese push to build ties with neighboring countries, with Mongolian leaders evidently embracing Chinese President Xi Jinping’s concept of a “silk road economic belt” through Central Asia (see China Brief, October 10; November 2). However, there remain significant obstacles to the relationship, both in terms of commercial disputes and mistrust of China among the Mongolian people and leadership. Prior to traveling, Mongolian Prime Minister Altankhuyag gave an interview in Ulaanbaatar to Xinhua News in which he said that Mongolia is located at a junction between Asia and Europe, and closely connects China with Europe and other parts of Asia by railways, roads and other links. Thus it supports China’s growing trade ties with Central Asian countries, and will also actively participate in the construction of a “Silk Road Economic Belt” (Xinhua, October 20). He flew on October 22nd to Sichuan province to participate in the 14th Western China International Fair in Chengdu. In his speech there he particularly sought to reassure Chinese investors that Mongolia was a reliable partner full of business opportunities, addressing concerns raised by previous actions against Chinese coal companies in Mongolia: “There are many projects and programs that the two countries plan to co-implement in infrastructure, mining and energy; so, the western region of China has been building opportunities to intensify mutually-beneficial cooperation with the southern and western regions of Mongolia” (The Mongol Messenger, October 25). On the third day of his visit the Prime Minister attended a Mongolia-China business meeting in Shenyang, Liaoning province where Mongolia’s Ambassador to China Ts Sukhbaatar noted that Liaoning has the closest seaport to Mongolia so “The province has potential to become our nearest partner in China” (The Mongol Messenger, November 1). In Beijing the Prime Minister met with 100 Chinese and Mongolian businessmen to discuss stability in Mongolia’s legal environment and plans for new major projects. On October 25, Altankhuyag met President Xi Jinping. Premier Li and he signed a strategic partnership protocol wherein, “The two sides agree that the establishment of the Sino-Mongolian strategic partnership is a milestone in the development of bilateral relations while the signing of the new document will promote bilateral cooperation in various areas for the consolidation and further deepening of this partnership” (Xinhua, October 25). China also promised to provide 1,000 scholarships over the next five years to Mongol students. Nine other agreements were signed covering economic and technical cooperation; regulation of civil aircrafts search and rescue work; establishment of a scientific park; disaster protection; Development Bank of Mongolia and China Development Bank cooperation; two MOUs between Mongolian Railways and Shenhua Group regarding coal sales over rail links to Tavantolgoi and the Ukhaa khudag-Gashuunsukhait border checkpoint; development of a coal gasifying plant with Sinopec; and MOU on buying additional oil from PetroChina (The Mongol Messenger, November 1). The MOUs with Shenhua, China’s biggest coal producer, would ensure a long-term buyer for the three Mongol companies (Erdenes Tavan Tolgoi (TT), Mongolia Mining Corporation (MMC) and Tavantolgoi JSC) operating in the Tavan Tolgoi basin, which contains 6.4 billion tons of coal reserves. One billion tons of coal will be shipped over 20 years—an average of 50 million tons annually or triple the 18 million tons expected to be exported this year. In a subsequent Ulaanbaatar interview Yaichil Batsuuri, CEO of state-owned Erdenes Tavan Tolgoi, explained the agreement with Shenhua also stipulates that any coal not wanted by Shenhua can be sold on the international market. Mongolia’s total coal exports fell to 11.38 million tons in the first nine months of 2013 from 2012’s 14.29 million tons, with the value of these coal exports dropping to $783.94 million from $1.43 billion. MMC exported 3.2 million tons of coal in the first half of 2013, which accounted for 42 percent of Mongolia’s total coal exports in the period. (National Statistics Office, businessweek.com, October 29) However, this year Erdenes TT has not earned revenue because it must use its coal production to repay a $250 million loan from 2011 to Aluminum Corporation of China (CHALCO), and it still owes 3 million tons, valued at $170 million. Shenhua second MOU with these companies and Mongolia’s state-owned railway company covers building a freight line to the Chinese border. Cooperation with Sinopec to build a brown coal gasifying plant would enable Mongolia to supply its domestic needs and export to the Chinese market. The target is to produce 15 billion metric tons of gas fuel annually, which would require almost 50 million tons of thermal coal at a cost of $1 billion yearly. The Mongolian Government is making plans for a gas pipe network (UB Post, October 30; , November 18) The MOU between Mongolia’s Petroleum Authority and PetroChina would increase Mongolian crude oil extracted from Mongolia for processing in China. Presently, up to 10 thousand tons of refined petroleum product is returned every month to Mongolia (english.news.mn, October 28). The Sino-Mongolian working group to oversee new rail, road, and pipeline links to Russia is key to Mongolia’s economic future. A Mongolian economics adviser reportedly said that landlocked Mongolia aimed to become a “transit corridor&#8221; to facilitate trade between its two giant neighbors and reduce the costs of delivering Russian oil and natural gas to China. A Mongolian official speaking anonymously to Reuters said that Mongolia would allow Chinese firms to invest and build in the hope that improved infrastructure will generate more revenue from its coal sector (Reuters, October 28). The Chinese also see benefits. Premier Li recommended China and Mongolia “develop an overall plan for railways and roads as well as natural gas, electricity and transportation linking the two nations.” He also said Beijing is willing to hold discussions on a free trade area around the border (China Daily, October 26). The Sino-Mongolian military relationship deepened in 2013 with the signing in July in Beijing of the Military Grant Aid to Mongolia protocol covering PLA and Mongolian border troops (infomongolia.com, July 3). From September 16–23, a total of four hundred soldiers from both countries took part in the Sino-Mongol military exercise, “Steppe Leader,” to practice disaster rescues, while concurrently in Beijing, Mongolian Minister of Defense Dashdemberel Bat-Erdene was signing an “Agreement on Military-Technical Cooperation” with PRC Vice President Li Yuanchao. This agreement regularizes the joint Steppe Leader military exercise, provides for mutual assistance in military techniques and supplies, organizes vocational training for Mongolian military personnel, and upgrades from observer status PLA participation in the U.S.-organized “Khaan Quest” multi-national annual military peacekeeping exercises (infomongolia, September 16). General Wan’s visit aimed at establishing the cooperative mechanisms agreed upon during Bat-Erdene’s trip. The Chinese military media asserted: “The Mongolian side takes Mongolia-China strategic partnership as one of the priorities of its foreign relations, and is willing to further deepen exchanges and cooperation…” (China Military Online, Mongolian Ministry of Defense website, November 15). While in Ulaanbaatar Wan met with Tserendejid Byambajav, Chief of General Staff of Mongolian Armed Forces, and toured the Defense University, Mongolia’s comprehensive training center Unit No. 311, and the “Complex for Peace” Bagabuyan rehabilitation center established by the Chinese government for Mongolian peacekeeping soldiers (english.news.mn and Montsame, November 15). This flurry of diplomatic activity masks troubling trends bubbling beneath the surface. A case in point is the four-month hold-up at the border of Mongolian copper concentrate from the massive Oyu Tolgoi (OT) mine operated by Turquoise Hill, a Canadian mining enterprise 51%-owned by Anglo-Australian Rio Tinto. OT, which began production in July and was targeted to develop 72,000-77,000 tons this year, is projected to cost around $14 billion but eventually contribute up to a third of Mongolia’s economy by producing more than 1.2 billion pounds of copper worth over $4 billion at today’s prices, 650,000 ounces of gold ($800 million) and 3 million ounces of silver (under $100 million) each year. In October, 38 thousand tons of concentrate were still locked in a Chinese border warehouse due to a customs impasse over regulations permitting only trade between Chinese and Mongolian companies not third country companies crossing the Gobi border (english.news.mn, October 22). When the first one thousand tons of copper concentrate moved across to China on October 22nd, foreign investors thought that finally the long-awaited OT production would proceed. Earlier in October the Mongolian Parliament had eased the controversial Strategic Entities Foreign Investment Law (SEFIL) which was particularly onerous for large state-owned foreign investor companies like the Chinese. However, the picture is not so rosy because other problems still swirl around OT, involving how to proceed with the funding of its $6 billion underground stage, cost overruns, and management disputes. As a result, development of OT’s second phase has been on hold since August over Rio Tinto’s continuing difficulty in finalizing an investment agreement under the original 2009 terms with the Mongols, who hold only a 34% share. Furthermore, Turquoise Hill in November suddenly suspended further work at OT due to financing problems. When on November 8 the Mongolian government cancelled another 106 mining licenses as part of its anti-corruption clampdown, again Mongolia’s economic forecast was riled with uncertainty about Chinese trade and overall foreign investment. Adding fuel to growing anti-Chinese sentiment among the Mongolian populace has been a report of the cyber intelligence agency Cyber Squared’s Threat Connect Intelligence Research Team (TCIRT) that Mongolia faces the problem of Chinese “state-sponsored” cyber-spies targeting Mongolian businesses and government agencies in order to monitor their relationships with the West. TCIRT claims there is “evidence of offensive tactics against Mongolian targets which are very similar to those long applied against Tibetan and Uyghur nationalists and affiliated groups.” The malware used came from an unidentified Chinese cyber-warfare unit that has been dubbed “Comment Crew” or “APT1.” Numerous examples were discovered of targeting economic, military, and diplomatic sources. Among the targets were the joint U.S.-Mongolia military exercise Khaan Quest 2014 and the June 2013 Mongolian presidential election. The Mongols believe the reasoning behind the spying is to help China understand changes in Mongolian relations with “third neighbors” such as the U.S., Japan, ROK, and European Union (The Register, english.news.mn, October 10). So despite the fact that China is Mongolia’s largest trade partner and foreign investor, with bilateral trade volume in 2012 reaching $6.6 billion, the Sino-Mongolian economic relationship remains in flux.